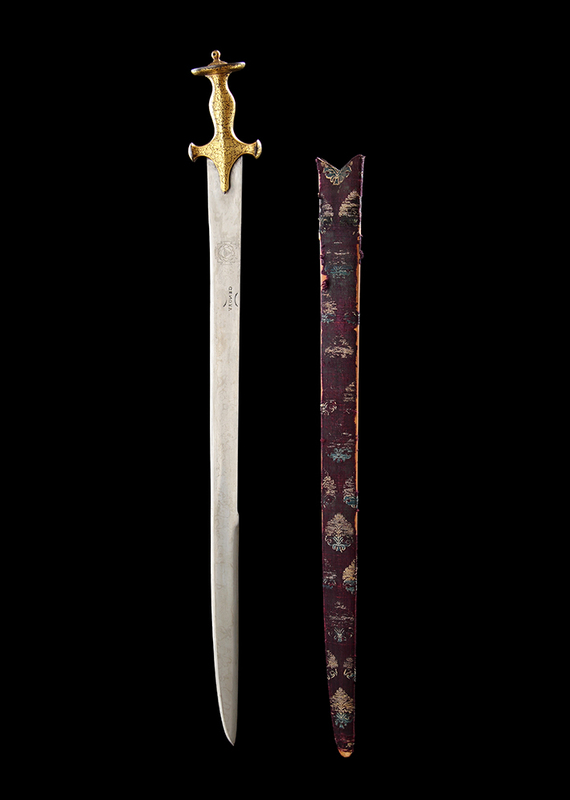 This 18th century straight sword (katti) has a hilt richly illustrated with golden flora. Long stems have been posed symmetrically, roaming from langet to quillon to pommel and enclosing small leaves and four-petalled flowers. A similar design can be viewed on an enamelled katar in the al-Sabah collection. The sword’s grip leans at an angle to the blade, a characteristic lost on swords in the 19th century. It is an arrangement meant to increase the sword’s cutting capacity but, in this case, adds to the overall aesthetic qualities too. The blade is of a quite elegant form and made of pattern-welded Damascus steel, highly polished in the Indian fashion. A long, low yelman runs for a third of the blade’s length. Two markings can be found on the blade. The first is a local interpretation of the name Genoa and intended to give an already high-quality weapon an Italian association at a time when imported European weapons were highly prized in India (especially those exported from northern Italy). This mark is positioned between two ‘eyelashes’, as is typical, and found on both sides of the blade. The second marking is a neatly engraved yantra. Yantras are mystical and geometrical cosmograms or diagrams used to worship deities as an aid in meditation, and they come in a variety of shapes and sizes, predominantly consisting of triangles, squares, hexagons, circles and so on. Much like the eyes on the ramdao swords of Nepal and Bengal, the yantra on this sword signifies Kali’s ‘presence’. It is considered to be a ‘para-rupa’ (an “abstract translation of the deity-image”). Kali is a much known goddess, progressing from a folk deity to her debut in the Devi Mahatmya, and finally standing on her own with her later developed iconographies. Many images and yantras speak of her popularity in India and beyond, even in the contemporary period. S. Kaoukji, Precious Indian Weapons and other Princely Accoutrements (the al-Sabah Collection), Thames and Hudson Ltd, 2017, cat. no.8, pp.48–49. Primarily these deities are females or Devis. For further reading, see Madhu Khanna, Yantra—The Tantric Symbol of Cosmic Unity, 2003. See Madhu Khanna, The Kali Yantra: The Changing Iconography of Dakshina Kali in Bengal, in–Art, Icon and Architecture in South Asia—Essays in Honour of Dr Devangana Desai, edited by Anil Verghese & Anna Dallapiccola, 2015. The reason behind the yantra’s inclusion is intriguing. It is likely that the sword’s patron was an ardent Devi worshipper but it is difficult to conclude whether the weapon itself was used as a sacrificial sword or for battle, or both. Either way, it has probably been included here to impart spiritual focus and guidance to the wielder. The blade is protected by the tulwar’s original scabbard, and made of wood, with much of its beautiful silk brocade covering still surviving. My thanks to Vinit Vyas for his help with the Kali yantra.